Back in the day, world-renowned British dog trainer Barbara Woodhouse wrote a book, “NO BAD DOGS.” She finished that sentence with…only inexperienced owners. Oh, Barbara, I beg to differ. I haven’t been without a dog since the age of 4, having had all shapes and sizes and breeds. And yet, I’ve discovered that even as experienced as I think I may be in the handling of dogs, they literally have a mind of their own and most of the time are going to do what they want when they want to. Just rethinking the size of these heels, Mommy! Take my dog Bella a Labrador retriever, for example, who doesn’t have a mean bone in her body. Most of the time, she’s as calm, gentle, sweet and laid back as they come. But take her to the park and let another dog attempt to walk by…uh oh…she yanks me like a rag doll and tries as hard as she might to pounce on the dog. It’s just so annoying. I’m always making excuses for her behavior, especially to those unwitting people who insist that their dog and mine make friends. I find myself saying, “Oh, she actually loves other dogs, so I’m not sure why she’s jumping up and down and acting like an idiot,” or “oh, she’s just a little too excited right now,” or “she’s just a maniac.” It eventually evolves into, “I wouldn’t come too close; she’s just so predictable,” or “NO, SHE DOESN”T WANT TO MAKE FRIENDS WITH YOUR DOG!” It’s exhausting. I wish it were different….I wish she would sweetly walk up to other dogs and play. And, honestly, that’s all she really wants to do; she just doesn’t know how to go about it in quite the right way. Where is Cesar Milan when you need him?On the other hand, Bella loves a bath, which is a good thing. 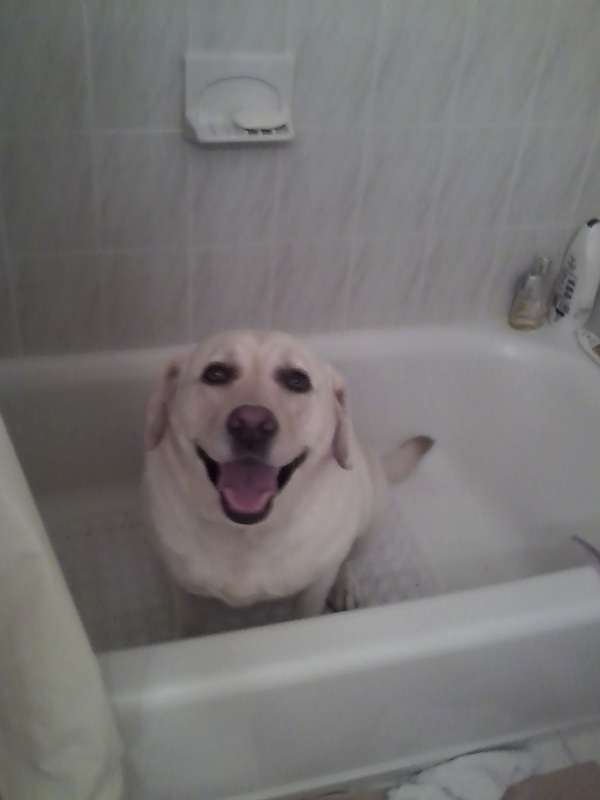 All I have to do is say the word bath, and the next thing I know, she’s sitting in the tub. Even if I just say the word in passing, she races to the bathroom. She gives me a good laugh and kind of washes all the other stuff away. And how about my daughter Megan’s and son-in-law Matt’s dog Riley. Riley has been somewhat of a problem child since puppyhood, especially with barking and annoying people who visit to the point of ad nauseam, and you just pray that they’ll put her in time out (the downstairs powder room) which happens quite often. For instance, Meg and Matt are recent newlyweds, and for her birthday this year Matt prepared her a bubble bath complete with candles, etc., (these are the kinds of things you get at the beginning of a marriage 🙂 ). As soon as Megan got home, she retreated to the tub, closing the door behind her. Riley was left outside the bathroom door and apparently was not too happy about it. She usually gets Meg’s undivided attention and a long walk. 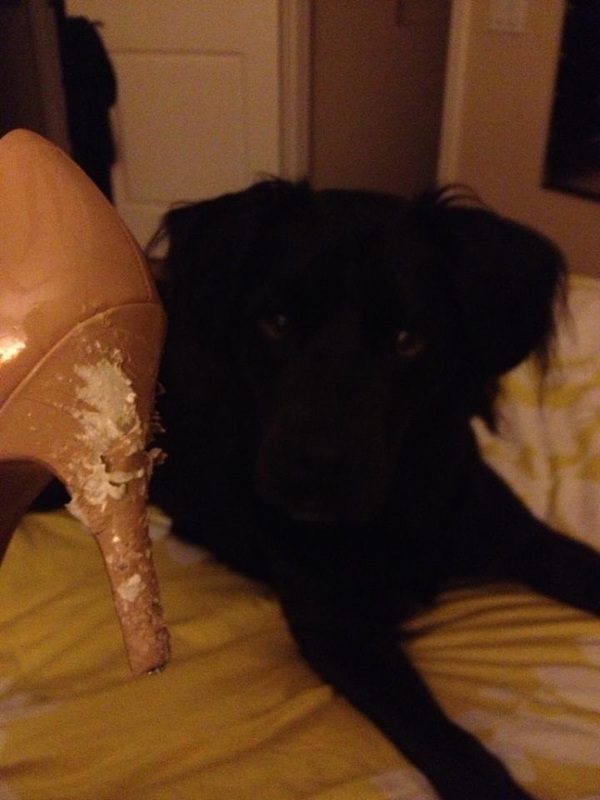 I guess she got mad because when Meg finished soaking she came out to find her favorite pair of shoes chewed up by you-know-who. Uncanny! But, then there’s Lulu, my daughter Katie and boyfriend Blake’s black Labrador retriever. To preface this in Lulu’s defense, she was a rescue dog, a puppy mill mother who at the time of her rescue weighed only 40 lbs. and was in very sad shape. She’s come a long way with a lot of tender loving care and has gone from 40 to 90 lbs. in a hurry. Lulu is sweet and gentle, but has a major food fetish…understandably. Let a bag rustle softly or a refrigerator door open, and she’s there. And when Katie and Blake go off to work, it’s SHOWTIME! At first Lulu got into the garbage, although it had a lid. 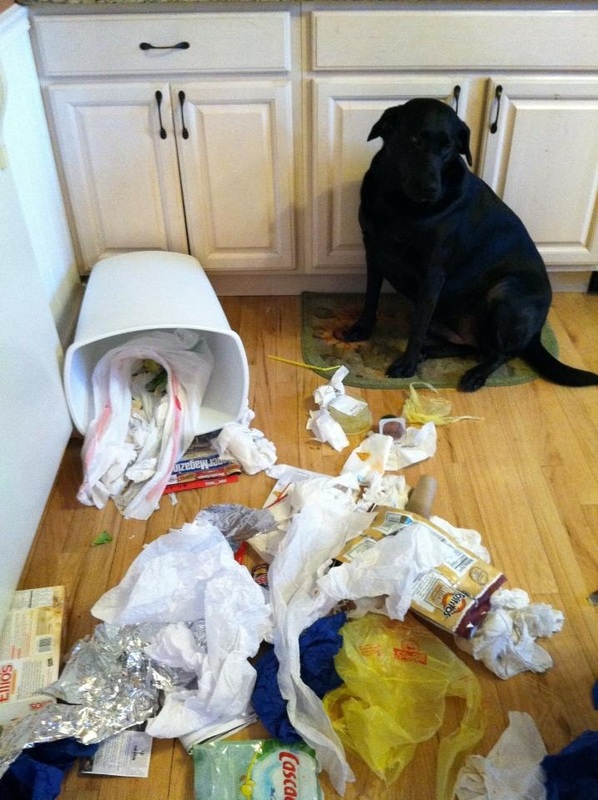 They are now very careful to put the garbage can in the pantry closet before they leave, but sometimes they forget and come home to a big surprise.Then it was the dog food, which used to be kept in a bag in the kitchen until it was ripped open and finished one day. They started storing the food in a plastic bin. 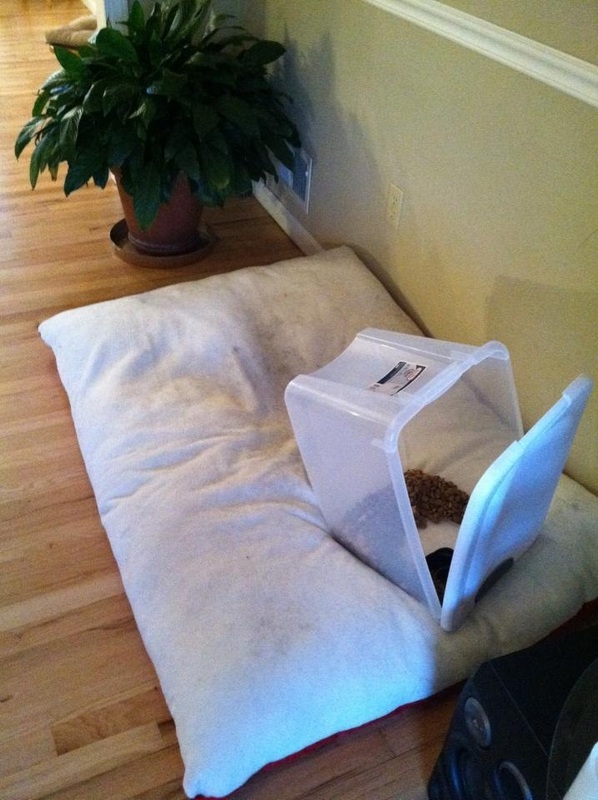 No problem…Lulu dragged the entire bin (with a full 20 lbs. 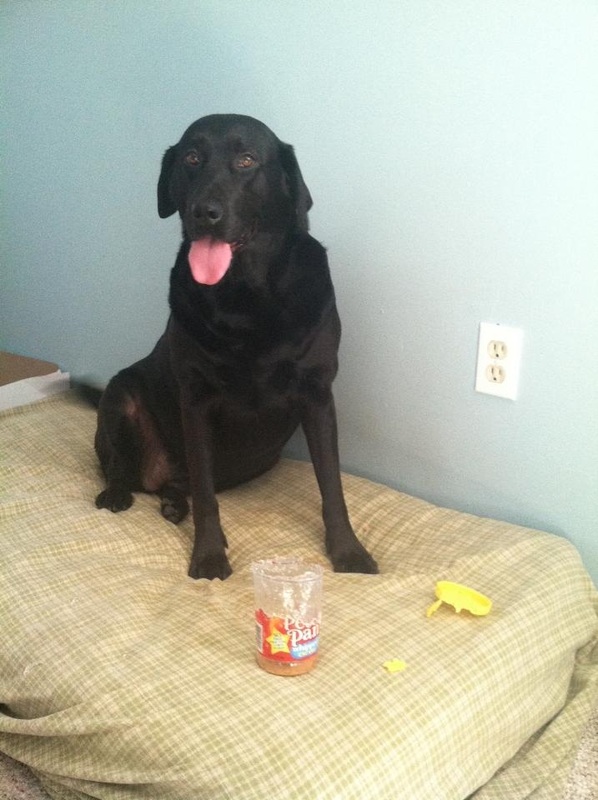 of dog food inside) to her bed and snacked all day until it was gone. The bin is now being stored in the pantry closet as well. Blake made himself a peanut butter sandwich one day and left the jar on the counter….another thing proactively being put away in the pantry closet. It’s getting crowded in there. The last straw came when the Great Houdini somehow opened the refrigerator door…PARTY TIME!!! It must have been so much fun to nose around and help herself to the feast in front of her all day long! Lulu was hiding that day when Katie returned from work…with good reason. Katie went upstairs to the kitchen to find the remains of the day. Items were dragged into the bedroom, onto her bed and around the house. The bed was covered in peanut butter and chocolate from a leftover birthday cake, a bag of cooked chicken was devoured, cheese was gone, etc. Food was strewn everywhere. Katie and Blake tried to retrace their steps to see if maybe they might have left the refrigerator door ajar…or not. No matter, Lulu had a five-star day! And she never got sick…just seemed very satisfied. When Katie dragged Lulu out of her hiding place, she took her to the refrigerator and gave her a scolding, pointing to the handle and saying No, No, No! Then she took her out for a walk. It’s hard to stay mad at Lulu when she cuddles up to you with those sad brown eyes. I’m happy to report she hasn’t gone into the refrigerator since. Must be that experienced dog owner stuff kicking in. But that was only last week. Or did they fit the refrigerator into the pantry closet as well?! Good dogs, bad dogs, we love them all. Eventually their shenanigans become funny stories to tell later on after you have finished crying…maybe…or not.